Ruegg, R. (2013). Editorial. Special issue on self-access writing support. Studies in Self-Access Learning Journal, 4(1), 1-4. 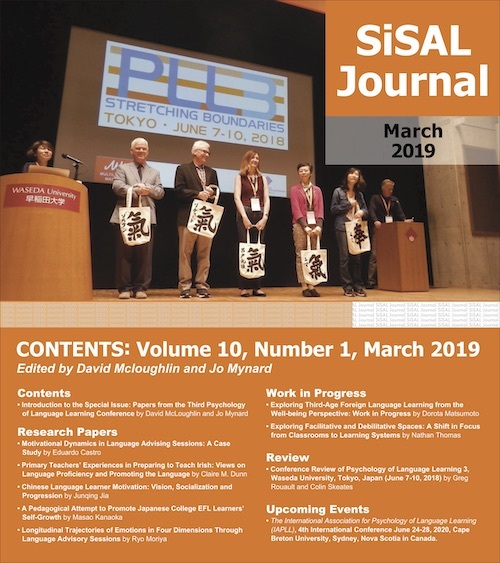 Welcome to this special issue of SiSAL Journal on Self-Access Writing Support. I believe that writing is a skill for which self direction is particularly important because it is so output oriented and as such is often such a solitary activity. Whether in the middle of a thriving Self-Access Centre, or at home alone in the middle of the night, writers need to know tools they can turn to for help, and need to understand how they can use those tools to best advantage. I am therefore glad to have had the opportunity to bring you this special issue on Self-Access Writing Support. In the first article, Elton LaClare and Tracy Franz look at a writing centre in an EFL context in Japan, investigating who uses the centre and what they use it for. The findings suggest that in an EFL context, a writing centre has a different function from that of ESL contexts. A majority of the users in the writing centre investigated were either graduate students or faculty members. These users came, not seeking advice about how to write, but rather seeking help with editing of the written product after its completion. The findings suggest that, while different from the role played by writing centres in ESL contexts, the writing centre plays a crucial role in the academic endeavours of the university. In the following article, Christine Rosalia gives an overview of three peer online writing centres she has been involved in, in three different college contexts. The first one was run on Moodle in an EFL Japanese context. The second was run on Drupal for Generation 1.5 writers in American first year composition courses. The third used Google Apps and catered for international students in an American ESL context. From her involvement in these three different peer online writing centres, Rosalia offers advice for others who may be interested in setting up their own online writing centre. She suggests that feedback is best co-constructed by peer tutors and that peer tutors should be given responsibility for decisions about the online platform, work guidelines, and protocols. In this way autonomy, interdependence and collaboration can be developed to enhance the experience for everyone involved. Finally, Jacqueline Mull experiments with learner use of a concordancer to self-correct errors in their writing. While some research has been conducted into the use of concordancers by second language learners, how much training learners need in order to benefit from the use of a concordancer is still unclear. Mull addresses this question in her research. Rather than offering an extensive teacher-led training session, the coordinator offered a five-minute introduction. Following this, learners played with the concordancer in a more self-directed way and asked the coordinator if they had any questions. After this training, learners had some success with using the concordancer to correct errors in writing. This study offers promise for the use of concordancers as a tool for the self-directed editing of language errors. Thaddeus M. Niles reviews a writing support website called ESL Writing Online Workshop (ESL-WOW). The website offers instruction on the writing process, focusing on grammar and rhetorical conventions and could be useful as a reference tool for learners. It would be particularly suitable for learners of lower English proficiency levels, for those in EFL contexts or for learners who are struggling to understand writing instruction in the classroom. Satomi Shibata reports on the Japan Association of Self Access Learning (JASAL) Forum held in Hamamatsu, Japan in October 2012. The issues discussed in this report include: Developing understanding of self-access among faculty, fostering a culture of active self-access use, integrating language learning into everyday life and integrating self-access with the curriculum. As stated by Shibata, it is not easy to develop understanding of self-access learning among faculty or to integrate it into the curriculum. For educators struggling with these issues, the JASAL Forum would seem to be a good place to get ideas. Rachael Ruegg is a lecturer at Akita International University and the coordinator of the Academic Achievement Center. She is also a PhD candidate at Macquarie University. She has been a teacher of English for 13 years in New Zealand, Japan, Germany and China. She is interested in writing; especially self-review, peer and teacher feedback and the development of learner autonomy in writing. First and foremost, I would like to thank the writers who contributed to this Special Issue. I would also like to thank the reviewers for the time they devoted to reading and manuscripts and offering valuable feedback and finally the editorial team for their help.